Another entry to my two year saga of monitoring a perennial favorite, an unusual (but not rare, threatened or endangered) find that’s inconveniently located in an area of high human and deer activity. Yes, cranefly orchid is back! I reported last summer that it had disappeared from this spot, but then in October I found some new leaves. And last Tuesday I saw a dozen flowering spikes. This species is hibernal: each plant grows a single leaf in autumn. The leaf persists through the winter and into late spring, then dies. In midsummer, the plant sends up a spike, which will flower for two to three weeks and then die. The cycle begins again the following autumn. Last year I thought that maybe deer browse had killed the plants. But I recollect that it was also a dry year, so maybe drought had something to do with it? Then a very knowledgeable and experienced acquaintance told me that cranefly orchid doesn’t necessarily bloom every year. This got me to wondering why, so I did a little research. 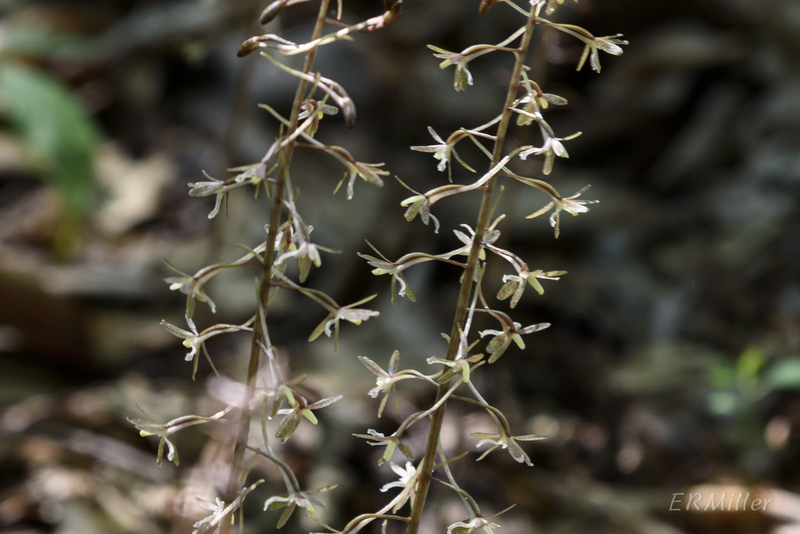 Studies have shown that when cranefly orchids are successfully pollinated and fruit is set, there’s a subsequent decrease in root and leaf size*. As a result, plants take a year off, so to speak, because they have insufficient energy stores for another reproductive effort. And blooming can also be affected by deer browse (herbivory) and environmental stresses. Also, check out those crazy long nectar tubes coming out the backs of the flowers! (Click on the image to see it larger.) 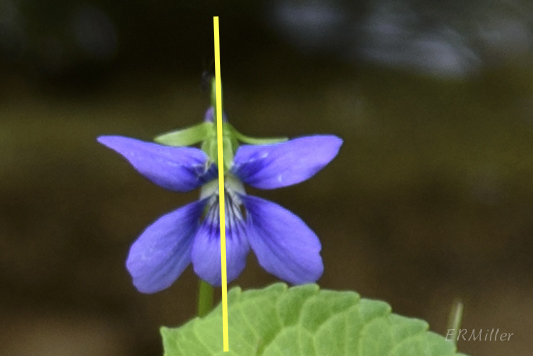 The odd shape of the flowers allows pollinia to be deposited onto visiting moths. 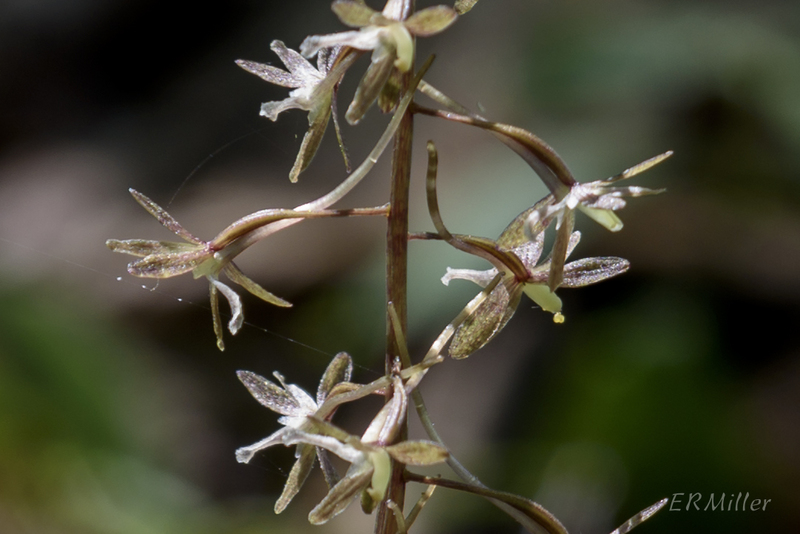 Cranefly orchids are just neat. 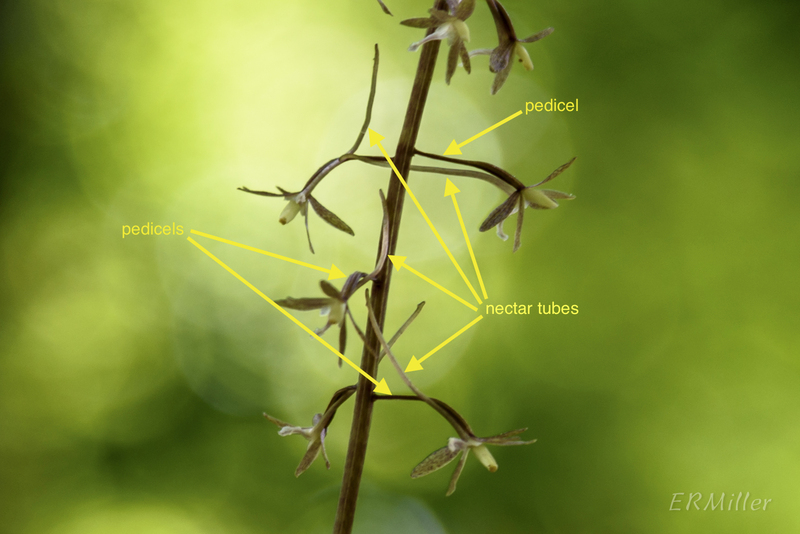 This entry was posted in Uncategorized and tagged cranefly orchids, Orchidaceae, Tipularia by elizabeth. Bookmark the permalink.